Ice crystals are present in a variety of clouds, at sufficiently low temperature. We consider here mixed-phase clouds which, at temperature ≳−20$^\circ$C, contain ice crystals, shaped approximately as thin oblate ellipsoids. We investigate the motion of these particles transported by an isotropic turbulent flow and, in particular, the collision between these crystals, a key process in the formation of graupels. Using fully resolved direct numerical simulations, and neglecting the effects of fluid inertia on the particle motion, we determine the influence of the turbulence intensity and of gravitational settling, in a realistic range of parameters. 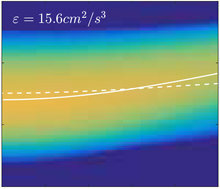 At small turbulent energy dissipation rate, collisions are induced mainly by differential gravitational settling between particles with different orientations. The effect has a clear signature on the relative orientation of colliding ellipsoids. As the turbulent energy dissipation rate increases, however, the influence of the turbulent velocity fluctuations becomes the dominant effect determining the collision rate. Using simple estimates, we propose an elementary understanding of the relative importance of gravitational settling and turbulent fluctuations.